Unfortunately my blog was not up and running when Sarah from Fairy Face Designs set up her summer sewing lists. Basically you were to make a list of projects you wanted to accomplish in the summer and people are now posting about what they actually accomplished. I decided to make a mosaic of the things I was able to accomplish pre- and post- setting up Knotted-Thread. It's nice to be able to look back when you're feeling totally overwhelmed and realize just how much you actually did do..
As i'm creating this I'm realizing just how much I signed up/on for through Christmas.. should be fun!! What a bunch of great projects! Good for you!! You have been busy this summer! Everything looks great, and I love the colors in your laptop cozy! Whew! Look at all of that goodness! You have a great smattering of color here. Can't wait to see where you go next. 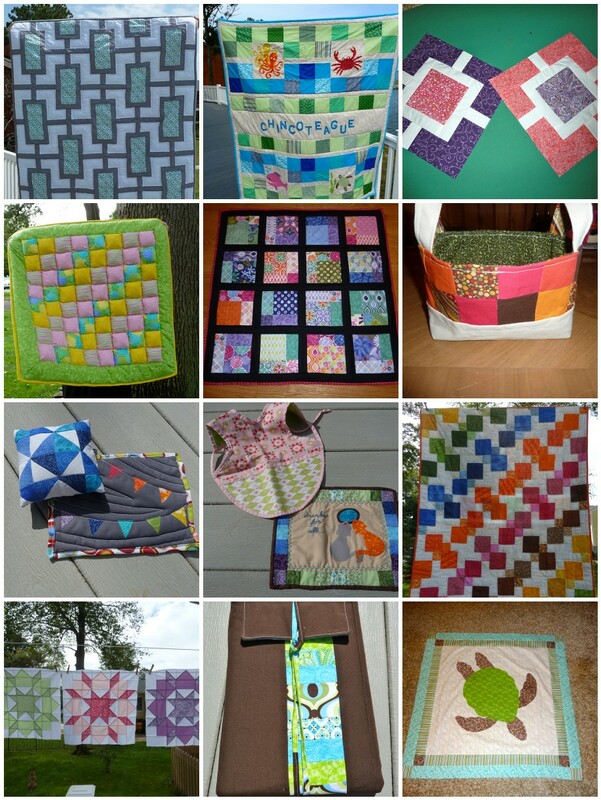 I am loving that Turtle quilt :) Also like the Swoon blocks you made. You've been so busy, isn't it great to look back and see how much you've achieved? Love your goodie swap items they're fab! And those swoon blocks...well, swoooon!! Thanks for linking up!